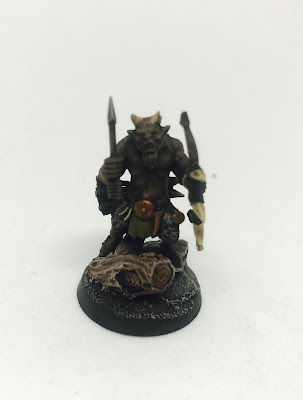 Today I bring to you my blog post on the Ungor Raider, these are pretty similar to the Gor models I showed a few weeks ago too. As you will see, I also painted 30 normal Ungor at the same time. You can find the painting guide for that soon. 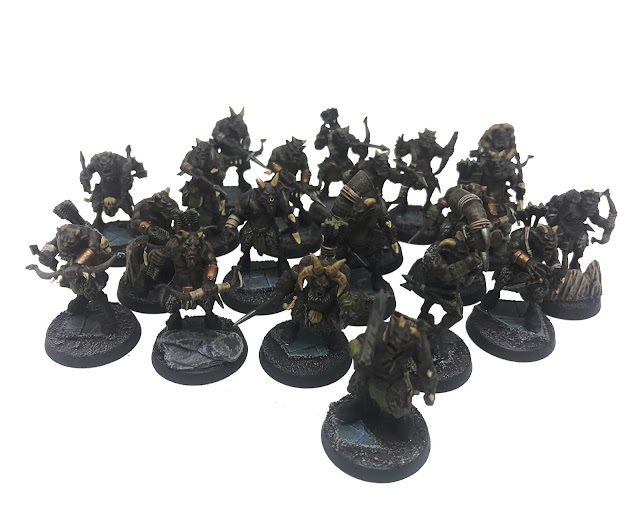 I started with this army by Undercoating them with a spray paint from Halfords in their Camouflage range called Super Matt Brown, this gives a basis for the Skin, Weapons, Leather, Shields, Fur. I used Terminatus Stone to drybrush all the fur and I used Gorthor Brown and drybrushed all the skin areas. I also base coated the horns with Zandri Dust and drybrushed all the wood (Weapons and Shields) with Sylvaneth Bark. All the brass details were given a base coat of Balthasar Gold, I then used Ushabti Bone to pick out all of the skulls and bone trinkets and Rakarth Flesh was used for all the straps and cloth. Then I washed the entire model with Agrax Earthshade and gave plenty of time to dry. I finally painted all the weapons and metal details on the shields etc with Leadbelcher and washed them with Nuln Oil, the loin cloths and some of the wrist straps were base coated in Death World Green (this is the spot colour and can be whatever you feel best for your models), I washed these areas in Camoshade. Here is the finished model. As you can see, it is clean but also gives a great dirty effect as well. If i want to, it gives a great place to go further pick out more details in the future, with edge highlights and layers. But for what I wanted and the amount of models I have to do, this is great for me. Awesome! Please do goes or bestigors!